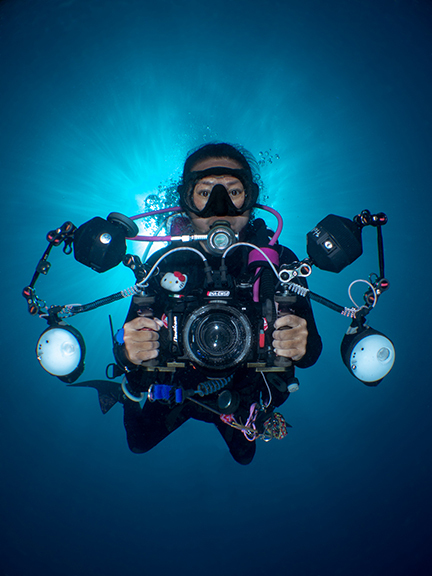 A close encounter with manta rays in 2000 inspired Lilian Koh of Singapore to take up scuba diving and underwater photography. Also drawn to tiny critters, her macro photography has won top awards. Lens Beyond Ocean 2017 Portfolio category winner, Lillian Koh's image (1 of 4): Keyhole. Costasiella kuroshimae, affectionately known as the “Shaun the Sheep” nudibranch, at Malesti, Tulamben, Bali. "I hope that through my photography I am able to show people the beauty of Mother Nature and her creations. I want viewers of my photography to see the amazing critters we can see and find in the ocean. From pelagic to macro critters, we divers need to do our part in protecting them." X-RAY MAG: Tell us about yourself, your background and how you became a diver and underwater photographer. 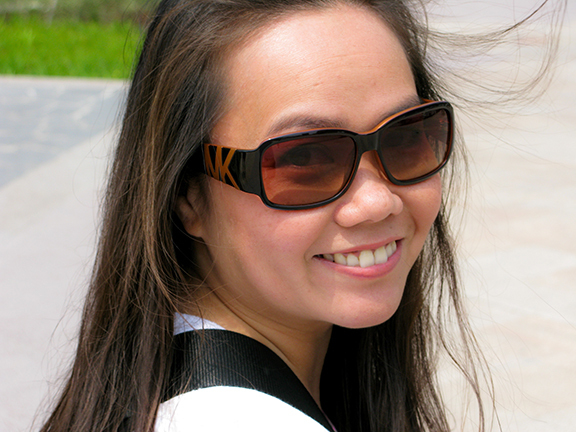 LK: I am from Singapore and formally worked in the banking sector as an executive assistant, with an interior design background. Currently, I dive and shoot whenever I can, after quitting my job many years ago. I did my Discover Scuba program in the Great Barrier Reef, and it took me more than two years after that to be certified. I was on a dive trip as a non-diver and had a close-encounter with manta rays, which peaked my interest to discover more. I signed up be a scuba diver within a couple of weeks. My brother was the first one in my family to be certified and I continued where he left off. It was on my first big trip to Sipadan, other than Tioman and Pulau Aur, Malaysia, when I was armed with a tiny camera with a 1-inch display. It belonged to my brother and I was told that if I managed to find a housing for it, I would be able take it with me. It was the last housing in the whole shopping mall, and every shop knew I was looking for this particular one. X-RAY MAG: What is the backstory behind each of your winning images. How did you get the shot? 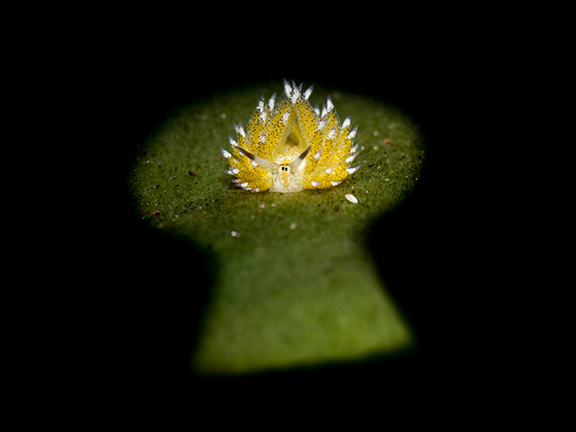 LK: For Keyhole, I was exploring a variety of ideas while using a snoot and wondering how to shoot everyone’s beloved Shaun the Sheep nudibranch (Costasiella kuroshimae) differently. The idea was conceived during a surface interval. Simple materials like duct tape and a penknife helped me to execute my idea and get the shot I wanted. For Shrine: When in Bali, it’s hard not to pay a visit to a temple. 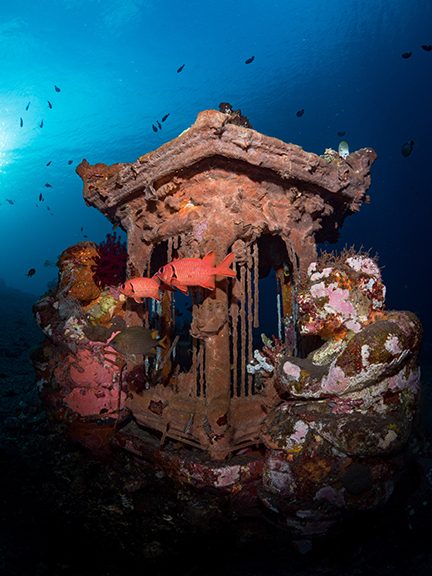 These magnificent structures were placed underwater and acted as sanctuaries for marine life. This image was taken during one of my visits. I picked a location and waited for the right moment for the fish to appear in my frame. For Snowing: This image was taken using a snoot. While I was shooting it, several divers swam passed and kicked up some sand. As you can see in the image, the sand added another element and created a snowing effect. 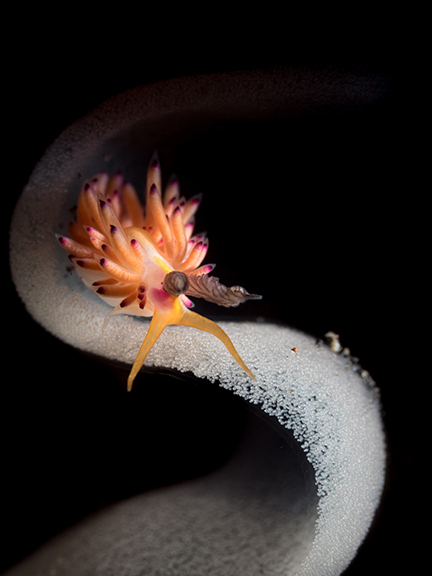 For Swoosh, I found this nudibranch feeding on a ribbon of eggs. At the time, the surge was strong. Every time the ribbon of eggs moved along with the surge, it created different compositions. While shooting and snooting in these kinds of conditions, usually I would have given up. I am glad I persevered and managed to get a series of images. X-RAY MAG: What camera and lighting equipment do you use? LK: I use an Olympus EM5 Mark II camera with a M.Zuiko ED 60mm f2.8 Macro lens or a M.Zuiko ED 8mm f1.8 Fisheye PRO lens, housed in a Nauticam housing, with Inon z240 strobes, plus a Retra LSD snoot. X-RAY MAG: How did you develop your style of photography? LK: Personally, I love isolation. That is why I am addicted to snooting. Able to control light, illuminating and isolating a subject from a busy environment, snooting helps the subject to pop in your images. 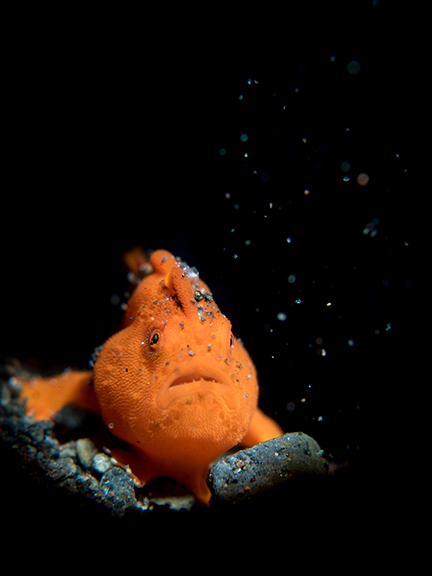 Normally, during a dive, I do not have a specific critter to shoot. I will have a few ideas in my mind and look for critters and a suitable environment, which is best-suited to executing the image. I will always bring my snoots during my dives and make sure they are always available when I need them. Setting up and positioning them requires time. Shooting critters with snoots requires not just time, but a truck load of patience as well. X-RAY MAG: Who are your role models in underwater photography or diving and why? LK: Basically everyone who takes photos underwater. Critters might be similar, but how photographers see them and what they see translates to their images. By studying other photographers’ photos, one will start to explore how they shoot and compose. It is always good to learn from it. X-RAY MAG: In your relationship with reefs and the sea, where have you had your favorite experiences? LK: It has always been my dream to dive with dolphins. Most of the time, I saw them from afar, while on a boat. Finally, during a trip to Cocos Island, Costa Rica, I encountered a small pod, swimming and playing around me. I just stopped taking photos and took in those moments just to enjoy their presence. X-RAY MAG: What are your thoughts on ocean conservation and how does your photography relate to these issues? LK: I hope that through my photography I am able to show people the beauty of Mother Nature and her creations. I want viewers of my photography to see the amazing critters we can see and find in the ocean. From pelagic to macro critters, we divers need to do our part in protecting them. X-RAY MAG: What are the challenges and benefits of being an underwater photographer in the world today? LK: Too many places, too little time to explore them all. I will slowly tick each location off the checklist. X-RAY MAG: How do people respond to your works? LK: I get positive comments from fellow photographers. I am very glad they like the way I present my images and are inspired by my art. X-RAY MAG: Do you teach photography? LK: I’ll be at the Anilao Photo Acad­emy (Philippines) as an in-house coach for a month, from 21 June until 21 July. X-RAY MAG: What are your upcoming projects or events? Please visit the photographer’s webpages on Facebook at: Facebook.com/liliankohphotography; and Instagram at: Instagram.com/liliankoh.